Happy Monday! My day went surprisingly well for a Monday (minus the kid whose parents were an hour and a half late!!!). 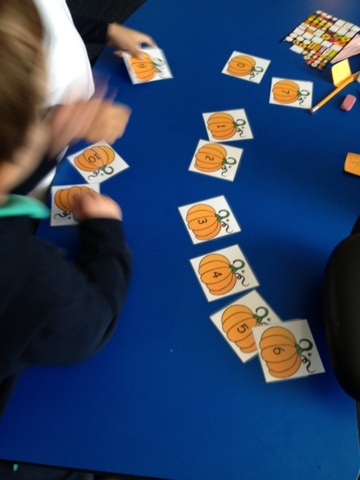 I taught the kids a new sight word practice strategy, Kindergarten practiced their counting skills, and we started our newest theme pocket books. Have I mentioned how AWESOME Evan-Moor theme pockets are?! I am in no way paid or encouraged to promote these, but I'm OBSESSED with them!! 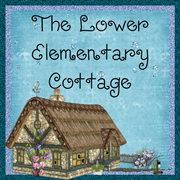 They teach common core standards in fun hands-on ways. 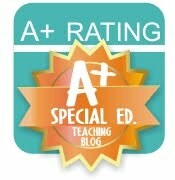 Read on to see why I think they are so amazing and totally adorable! 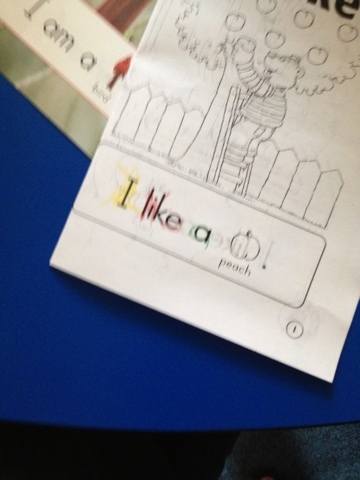 Kindergarten is starting to get pretty good at their sight words, so we practiced identifying them in print. 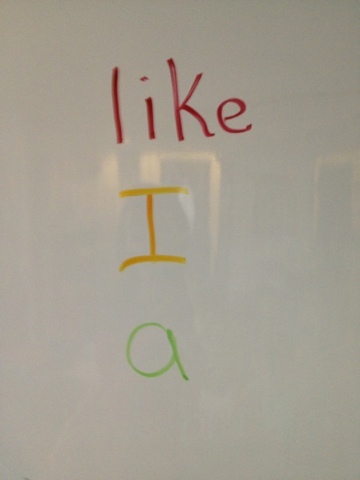 I had the students use a different color for each sight word. 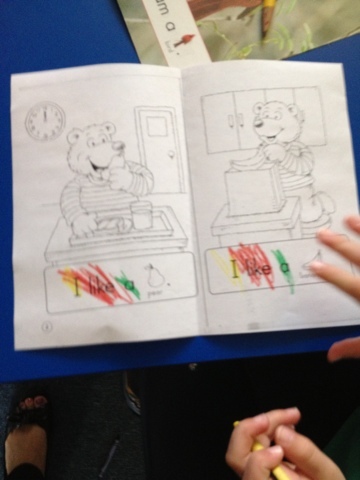 We actually did 4 sight words, but I took the pics in the middle of the task. The kids really liked this, even more than I thought they would. My kid with more fine motor skills chose to trace each letter, and one of the boys with fine motor struggles just colored the whole word. I wasn't picky, I just want them to be able to read the words. My Pumpkins, Bats, & Spiders! Oh My! Activities have been a huge hit!! The kids were fighting (more like seriously discussing) who was going to get to count the spiders first! LOVE it when they can't wait to learn! I also bought these perfect little counting pumpkins at Target (did I mention I have a serious Dollar Spot problem?!). 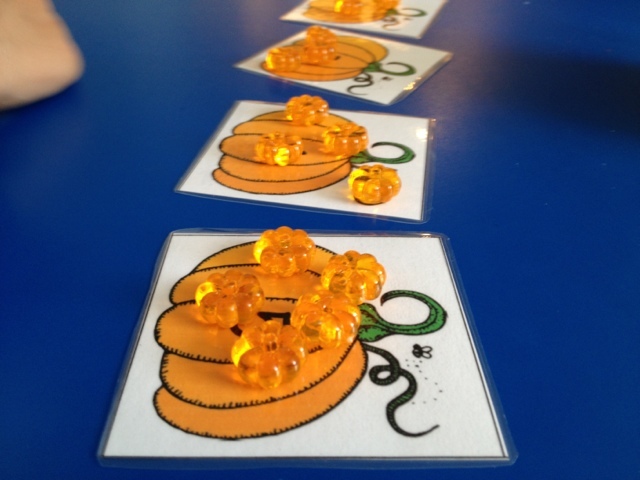 They call them "table scatter," but I prefer "fun kindergarten counting stuff!" Time to explain the oh so amazing theme pockets!! I use them all the time for theme units. Some are made up by me, but this week they are made by the wonderful publishers of Evan-Moor. 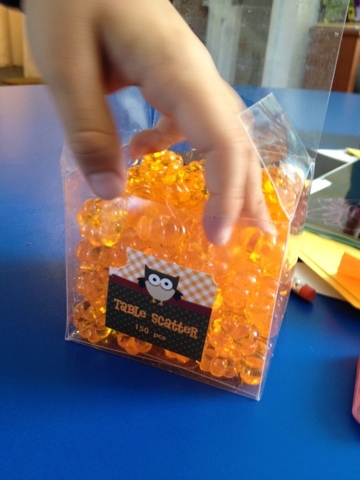 The kindergarten Halloween pockets focus on fine motor and other basic school skills like cutting and gluing. 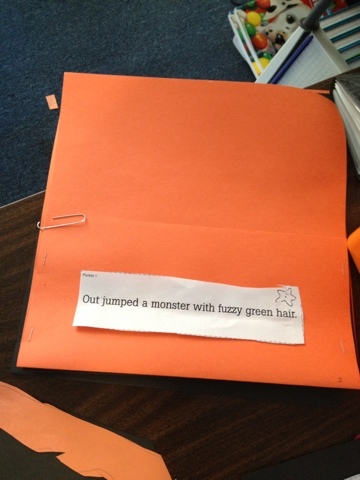 The pockets are: monster puppet, costume popup book, mummy, pull-up Jack O'Lantern, candy corn craft with acrostic poem, and paper bag ghost and riddle activity. 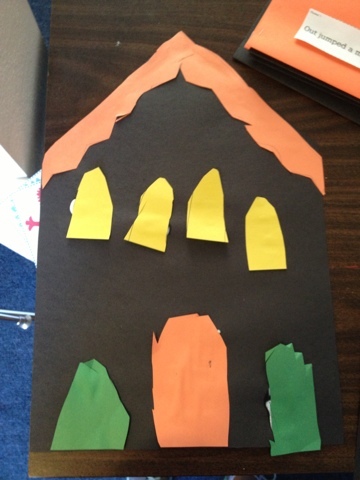 Today we focused on making the books and Haunted House cover page. 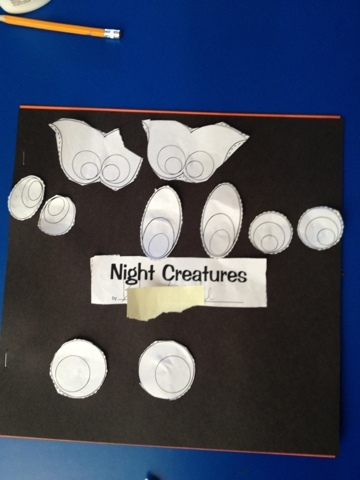 First/Second graders are doing the Night Creatures theme pocket. 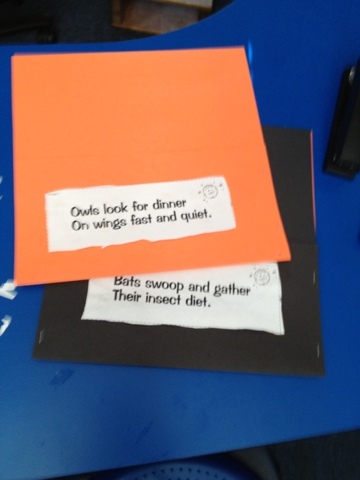 They will learn about nocturnal animals, and compare/contrast them. The 3 pockets are: bat, owl, and koala. We made the cover and page labels today, and we'll start the bats pocket tomorrow. The kids were soooo engaged in the activity that I barely heard anything other than the sound of pencils tracing or scissors cutting! Note: I cut the pages and folded/stapled the pockets ahead of time. Older kids can do this...little guys... not so much!